The lazy fox was a really good place to stay, clean, well located, comfortable, everything you need even a rooftop! The staff is really nice and you will always find someone to speak with or to share a diner in the common space ! I would definitely stay there again, thanks for everything ! 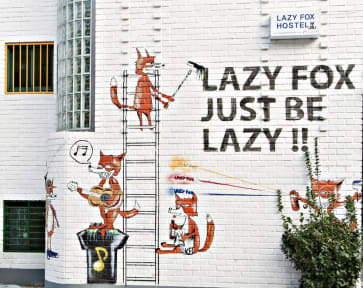 Perfect experience at the lazy fox hostel. The neighborhood is calm so you can rest well, if you walk 5-10min to find nice restaurants, bars & clubs. The staff is very nice and takes everyone out to eat and drink. Best hostel ever! The owner and the manager are really nice and charming. Thanks to them everyone feel confortable and at ease. It's very easy to meet the others Backpackers and to go out in the really lively neighborhood of Hongdae. I recommend. Very helpful and kind staff, they manage to create a very nice and spontaneously friendly atmosphere where everybody talks to each other. We could have stayed many more nights if it wasn’t fully booked for the new year 😁. The manager (Sun) was the nicest host we’ve had in Korea, super helpful, with a perfect english! One plus, the breakfast was super tasty 🤤. I would go back to the Lazy Fox 100%!! Staff friendly and very helpfully. Close to the subway and the night life. The room are confortable. It's a really nice place if u want to stay some days in busan. A really awesome vibe in here ! Thanks to Hélio & John. Correct sans plus... La propreté pourrait être meilleure.